A card is a visual, detailed representation of an activity included on your pipe. In a sales pipeline, each card represents a new potential customer moving through all the phases of your sales process. From prospecting to closing the sale, all the information you gather throughout the process is stored within the card. In a purchase process, each card represents a request for an item to be purchased or a service to be hired. Even though cards represent different things in different pipes, they're essentially pieces of information gathered to guide an activity. Cards move laterally from left to right through the phases of your pipe. Your pipe will probably have a few phases for your cards to go through, therefore it’s normal to see different cards in different phases of your process simultaneously. However, if you notice that your cards are piling up and accumulating at a certain phase, it seems you’ve found your process’ bottleneck! Let's have a closer look at the anatomy of the open card! This is an open card. As you can see, it's divided into two main sections: the right side and the left side. The first important thing you need to remember is that what you see on the left side is all the information you've added to this card on the previous phases. You've used the start form and phase's pre defined fields to add unique information to this card. On the right side you'll see the fields you've added to this specific phase. This is the information you/your team must provide and/or actions you must perform before moving the card on to the next phase. Every card that enters this specific phase will see these same fields. The information you'll input into the fields, however, is unique. 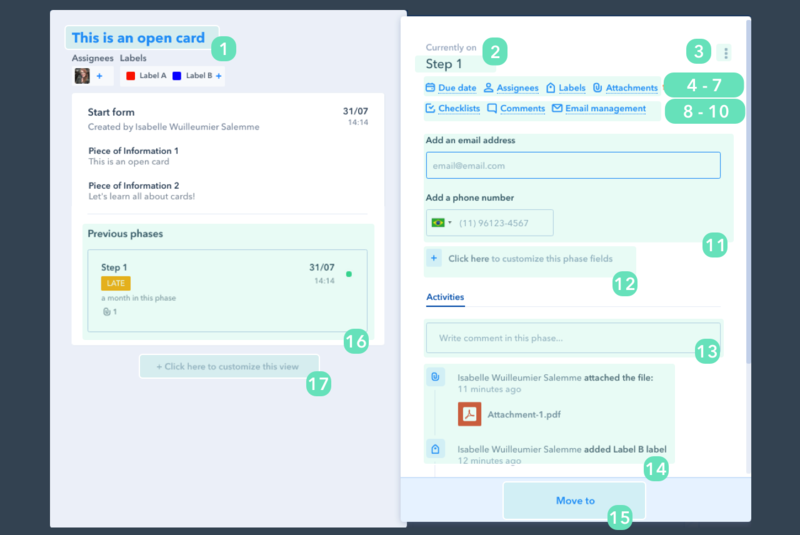 Customize view: Edit the information you want to see in the left side of the card. 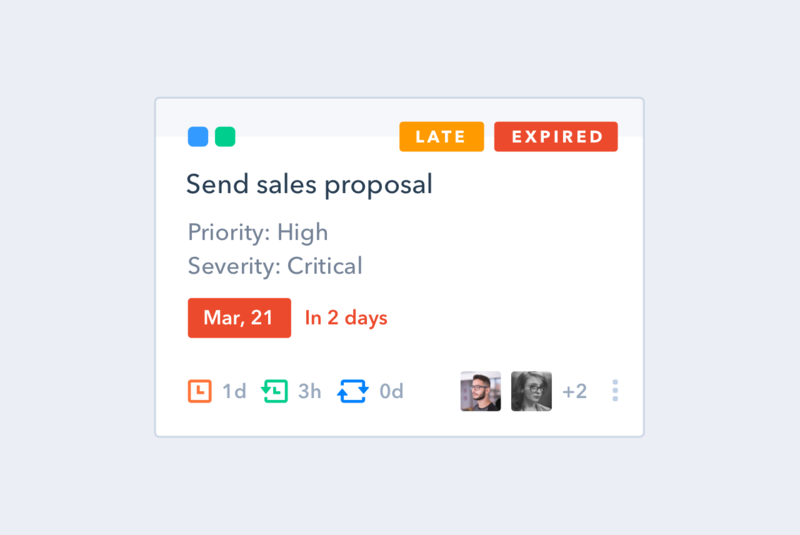 Besides the previous phases' activities you can choose to view comments, checklists, attachments and emails.